A radioactive metal from the 2011 Fukushima nuclear plant disaster in Japan, discovered Tuesday in Canada’s west coast, has sparked alarm about the long-term impact of radiation on people and the environment all over North America. While the levels detected in the Cesium-134 fragment are said to be below the permissible limits for drinking water, the finding seems to confirm the radioactive stream of toxic fluids released during the accident has already hit this side of the globe, as predicted last year. When the Fukushima Daiichi nuclear power plant was damaged three years ago, scientists began monitoring the ocean waters in the Pacific for the radioactive elements released by the plant — specifically the isotopes cesium-137 and cesium-134. Cesium-137 is already present in seawater, left over from various nuclear weapon tests performed during the '50s and '60s, so detecting that isotope alone isn't unusual. Cesium-134, the one found in British Columbia, has a half-life of two years, which means its radioactivity is reduced by half during that time. Detecting both at once, however, is another story. 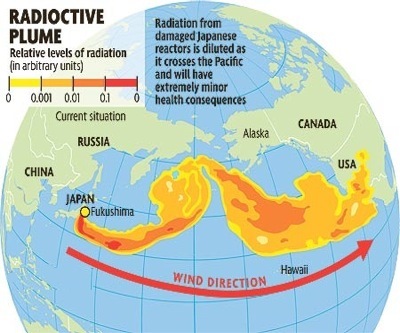 In June last year, researchers at the Bedford Institute of Oceanography identified quantities of both isotopes along BC’s coastline, showing a clear signal that this was radiation specifically from the Fukushima disaster. While many could argue that any level of radiation is damaging, experts said it's important to remember humans deal with radiation every day, as many of the foods we eat contain naturally occurring radioactive elements. Experts believe Fukushima will stay susceptible to failures for years, while the work of dismantling and cleaning up the damaged reactors is expected to take decades.